Max is a creative. He has an idea to create a solution for standing in long lines at shop. He has a lot of ideas but he is struggling with planning and making his project real. How can Max start? What does he need? Then a friend of Max advises him to try Creative Project Canvas which can help him to make his idea real. Jenny is a facilitator who helps for artists to make their own project. She makes presentations and workshops from time to time and she searches for something new to provide for artists. Jenny finds few tools which could be useful for her but still she is not confident how to use it. Then she discovers Creative Project Canvas and starts to analyse 9 themes of it in the Work Play Book. 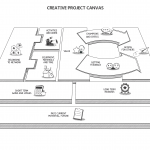 Jenny and Max needed a tool and instructions to solve problems and help others which they found it – Creative Project Canvas. It’s the block where Max had to discover values of the project for him and for others. He was thinking: why I am doing this? ; why is it important for me? ; how does it satisfy me? ; why is it important for others? He wanted to help others and satisfy the customers. For others it had to be time saving and happiness. 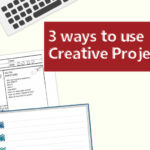 Each project has these three important elements which Max had to think about also. What kind of materials and equipment does he need? Where can he get resources? Maybe it could be few places/companies. Sure, it is important to count how much money, time does he need to improve his project and where will he get money from a project? Max knew few companies which could be interested in this project and could help him with resources but also he had to get all licenses and confirmations for the project. In this block Max has to imagine all main activities which have to be done during the project, it’s not enough just the preparation and completing the idea. Also, he should think about marketing, promoting, reviewing and feedback. He can use a list with people who are going to help him and do those things or he is going to do it everything by his own. So he will check activities involved with: people, planning, making art, finance and investment, legal, research, communication, other operations and last but not least impact. Max was so concentrated on his idea that he didn’t think before about how his work will be reached and how he is going to reach his users/customers. 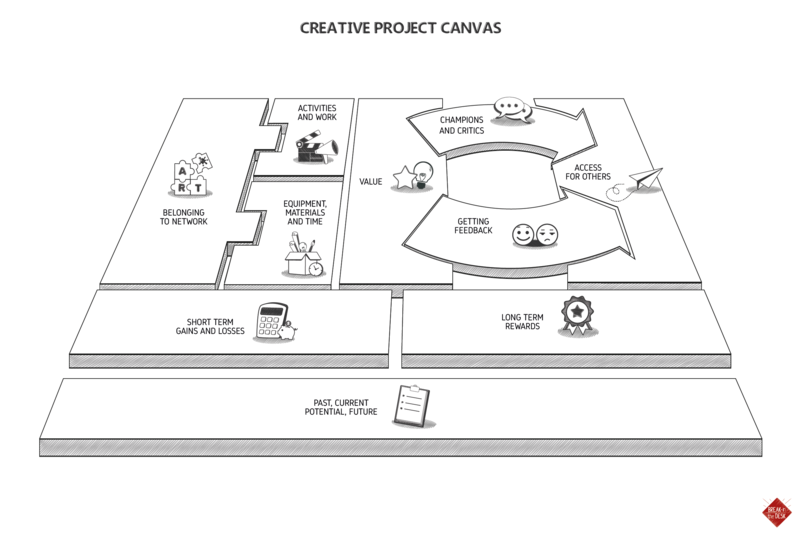 Thanks to Creative Project Canvas he created online and physical ways how to reach his users. He doesn’t know a lot about communication, so he found a person who advised him which communication ways are the best and how to recognise his audience. Surely Max wants to know what people and organisations are thinking about his work. For this he created a list of people, organisations and time when and how often he wants to get the feedback and in which way. With this list he will never forget to improve his work considering the feedback. In this block Max had to consider who are his work champions and critics. Which people support, encourage him and which could give him open critics to improve his work? Even thought that he spend some time for thinking and choosing people, he feels happy to have clear indications for impact on his work. Max thought about the networks he belongs to and what kind of information or contacts that could give. Then he realised that he needs to travel or make a contact with users in other countries and to spread his idea in there. Will he learn from meeting new people and travelling? Yes, for sure! Will Max get happiness from his project and will he expand his contact? Yes, he evaluated his project what he will gain and loose. Of course, he thought that he is going to lose a lot of time, energy and even money but it is still worth to do it for gaining all personal skills during the project. Finally, but not least Max thought about the success of his project, how he can make it sustainable and how he is going to look like in society after doing this project. Luckily, he is thinking to be more recognized in his country and to start his adventure in other countries to be more independent than he was before. Well, now Max has his way to do the project and he is confident about it. 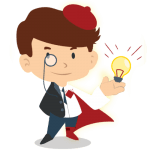 It is great that if he has some questions, he can always discuss them with other Creative Project Canvas users or just ask Jenny or another facilitator. Isn’t that amazing? Max is going to complete his project. What are you waiting for?